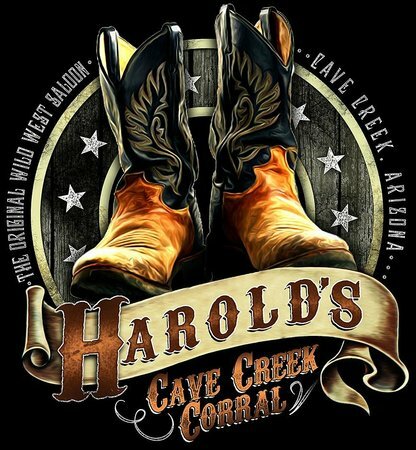 Harold's Cave Creek Corral currently has no events posted. Harold's is THE place in Cave Creek, Arizona for good food, great music and a dang’ good time. Hitch yer hat, hang yer hoss and kick back to enjoy some good times eatin’, drinkin’ and dancin’. Harolds serves up the best durned cooking in these here parts (or any other parts, for that matter). As Cave Creek’s original “Wild West Saloon and Restaurant,” Harold’s is a landmark and popular stomping ground for both locals and tourists. Celebrating over 70 years of history and good times. If it happens in Cave Creek, it happens at Harold’s. Johnny Walker opened the Corral Bar in 1935 to serve the workers who were building Bartlett Dam. It became Harold’s Cave Creek Corral in 1950 when local character Harold Gavagan purchased it. It has spawned a million crazy stories – from lions and tigers caged in the back to Harold himself along with his flamboyant friends, movie stars, (real) cowboys and other colorful characters. Gavagan’s flamboyant ways helped to turn it into the local landmark that it is today. Harold’s features seating for 600 inside, 200 on outside patio, 2 bars, a large stage and dance floor, free Country Dance Lesson on Friday’s from 7:30pm to 8:30pm and Live Entertainment by some of the BEST bands in the valley Wednesday through Sunday. Harold’s features the finest Choice hand carved steaks and daily delivered fresh seafood. All our BBQ meats are smoked on premise using mesquite wood to provide a traditional southwest flavor. Our wide variety menu features everything from Salads, Steaks, Seafood, Italian & Mexican dishes, to the best Hamburgers in Arizona. Harold’s Corral is the official home of Heinz Field West, a Pittsburgh Steelers Club. It is the place for all faithful of the Black & Gold to meet on Sunday, watch their beloved Steelers and down a couple of Iron City beers. There is always something happening at Harold’s. Whether you come here for one of our annual events such as Fiesta Days, 3rd of July Fireworks, Bachelor & Bachelorette Auction, Gong Show, Hawaiian Luau, Wild West Days, Harold’s Anniversary Party or one of our many charity events. Harold’s Corral is the place where the festivities begin and end.